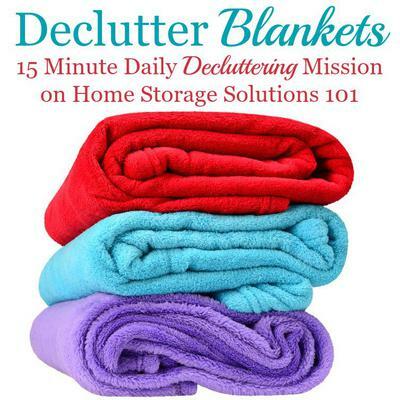 Today's mission is to declutter blankets, throws and comforters in your home. As always, we're not getting rid of all of them, but only excess ones. Once you've done this mission you'll realize how much room these items take in your home, because they're bulky, and it will clear space in your linen closet or wherever else you store them. This mission is designed to be done while working through the Organize Linen Closet Challenge here on the site, which is part of the 52 Week Organized Home Challenge, but of course you can do it whenever you need. Doing this mission is quite simple. All you need to do is gather up all the blankets, throws, quilts, and comforters you've got in your home into one place and then decide which ones to keep and which ones to get rid of. As always, get rid of the ones you don't like, that are too tattered or torn to use, and any that are excess. How Many Blankets Should You Keep? Deciding how many blankets and similar items you need is a very personal decision, but I'll provide some guidelines and rules of thumb for you to help you along, plus some places you may not have considered that you might want to stash a blanket or two. First, think about what you need for bedding in your home. You will only need 1-2 blankets, and/or one blanket and one comforter (or duvet) per bed, maximum, in most instances. You should also remember that sometimes that may be used for guests. Second, in addition to those blankets for your beds, I know a lot of people enjoy having a blanket or two to curl up with on a couch or at other times that they're relaxing. Once you've considered those issues you should basically have decided on a preliminary number of blankets to keep, and then the rest are excess, at least for normal use. (3) For pets, who themselves may enjoy a blanket or throw, especially one that's past its prime for human use. Once you've considered these additional places to keep blankets, then any that are excess for normal use, and in these special areas, should leave your home. If you get a bit nervous about the number you've decided on though, because, for example, you want to be assured you've got enough blankets for very cold nights, or when the heat goes out, consider how many people there are in your home typically, and make sure there are about two blankets per person for that eventuality. (Again, these can be blankets that would normally be on a bed, or from the couch). If that number is larger, keep that many, at most, and then you can feel more comfortable with getting rid of the rest of them. Once you've decided how many to keep choose which ones will be decluttered. As always, you can typically sell or donate any that are still in good condition. There are some good ideas below of possible places to donate. 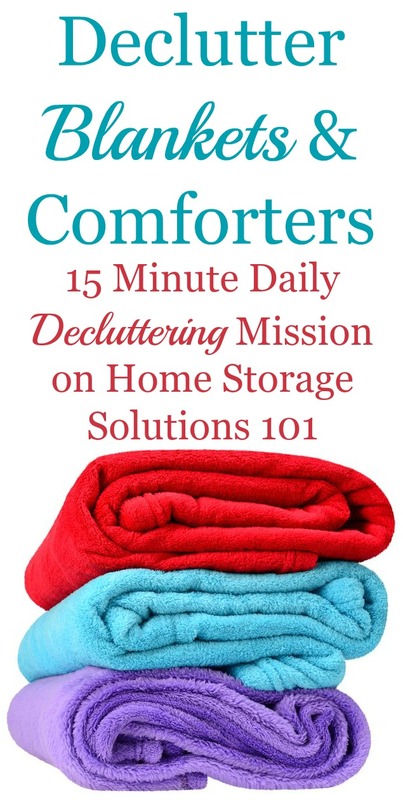 Several readers have sent in photos showing how they've done this mission and gotten rid of their blanket clutter. These photos, I hope, will inspire you to get this clutter out of your home as well, plus give you some ideas of what you can do with your excess blankets and other bedding clutter. The photo above is from a reader, Melissa. She explained, "We took blankets out to the local coat rack. 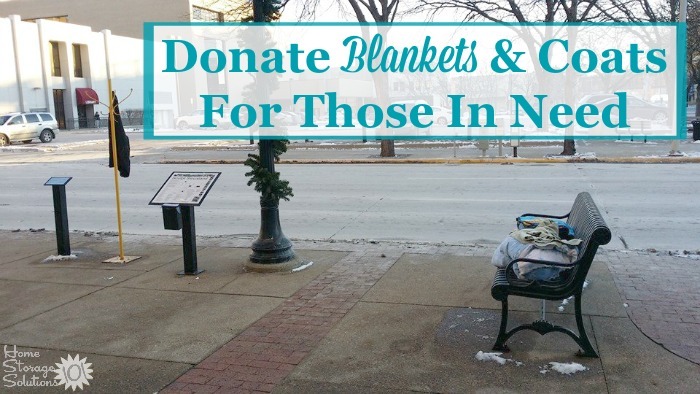 We do not need 20 blankets but homeless people might." What a great place to donate your blankets Melissa! Thanks for that idea. Another excellent idea is to donate them to a local pet shelter, many of which are looking for many types of used bedding for the animals, including blankets, towels and sheets. 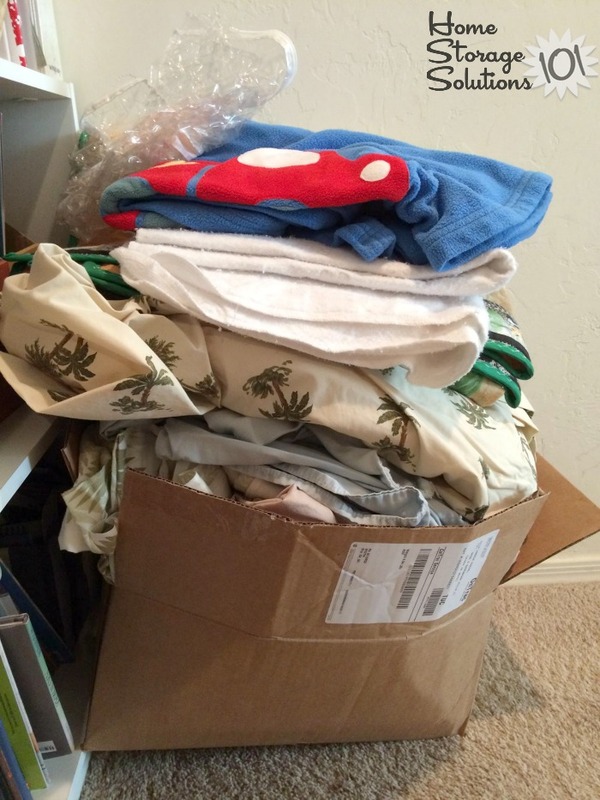 The photo above is from another reader, Amy, who said, "Got rid of all this, plus a giant trash bag of decorative pillows! It's loaded in my trunk right now to go to a women's shelter! Woohoo!" Yay Amy! Great to get all those bulky items out of your home, plus donating them to a women's shelter is also a wonderful idea. 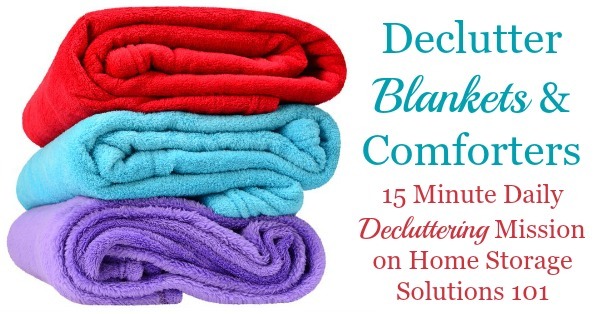 Are You Ready To Get Rid Of Excess Blankets & Comforters? The photo above is from a reader Adrianne. She said, "4 trash bags, some blankets, and another bag all donated today!" Just imagine all that stuff leaving your house, like Adrianne or the others who've shared their photos! I hope it gets you excited to do this mission for yourself! 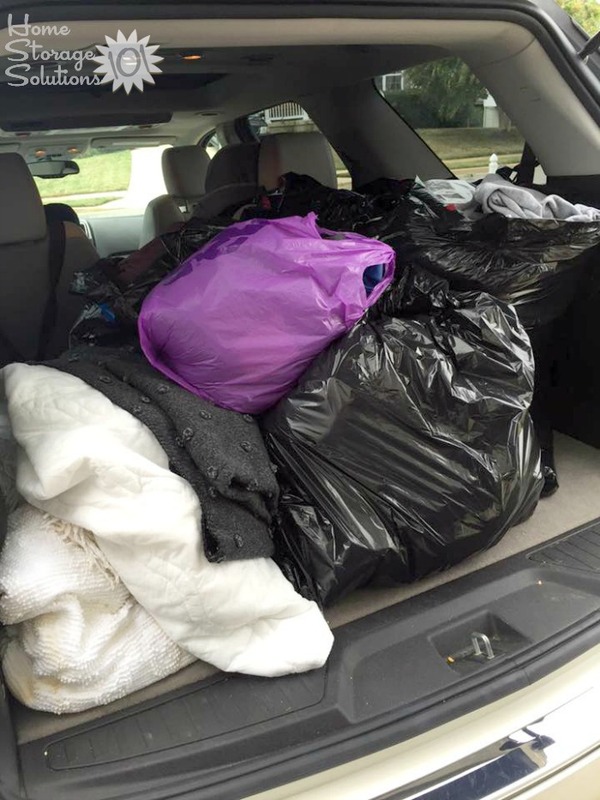 Comments for Are You Ready To Get Rid Of Excess Blankets & Comforters? I give old blankets and towels to pet shelters/animal rescue farms. how many to keep for guests? I have the question of how many to keep for guests to stay? Also ask broke or upcycle quilters. We can always use more blankets for batting. It is good to recycle the torn ones by donating to animal shelters always in need, patching them with a pretty quilt piece and donating to shelters/homeless or saving to sit on at football games or to watch fireworks on the lawns in the summer. Put them in a spacesaver bag and tuck away with seasonal stuff. I keep way too many - most of them have some sort of sentimental attachment - handmade, etc. I keep too many but I've been donating them to the women's shelter for their use or to resell. I struggle for storage space. I recently downsized to get rid of more worn out ones or too "childish" as my kids are growing up. But with 3 kids I like one extra clean set in a bin as when they get the flu it's usually in the middle of the night when I don't have the energy. But there are others I cannot get rid of such as my grandma knit me one, etc. I've found an old dresser works for storing extra sheet sets for company, and a few extra throw blankets. I put my blankets in a box and also put a few in my car just in case I get stranded on the side of the road. My grandmother taught me that. Always better to have just in case. We have specific camping blankets, otherwise I have 3 for guests in the house, the camping blankets stay in the garage in designated bins. We have a lot. I keep some for the dog and the kids all have a bunch. It's my issue. I do not get rid of blankets once the humans are done with them they move on to the pets! Always a use. Church quilting groups can use old blankets for mission quilts. I have used my extra throws for my t-shirt quilts. They always have to have a backing and these are great! They are wonderful for many types of sewing projects! Saves a lot of money on buying fabric. I have also kept a couple in my workshop for moving and storing furniture. I have 2 college students that move frequently. I keep these in my workshop with all other moving supplies. I have also used some for my dog house outside so they can cuddle in the winter. I keep a couple in garbage bags and put in my attic storage. Fortunately, I have a lot of storage space, but I have decluttered and gotten rid of anything I would never use again! I use the rule of clearing out 3 times. After the 3rd time of looking at it, it loses the emotional attachment unless it is a really special item! I've had 3 yard sales and donated 2 large truck loads to The Rescue Mission. It sounds so easy, yet I always end up keeping more blankets and quilts then I need. I hope I can do better after reading this! I have so many blankets. I love to cuddle but how do I decide? The blanket my grandmother crocheted for me for college, the one my mother in law made. My sister doesn't send a lot of gifts and she gave me one or the last trip I took with my husband before he passed away and we bought one. I could go on and on. I cuddle in them and feel wrapped in love. Help!!!! We no longer use commercially made blankets that coordinate with our bedrooms. I washed & donated them during the bitter cold to an agency that would share them the same day. My daughter taught me that a quilt is like a hug from everyone who wore the clothes or took care of them, as well as everyone involved in making the quilt. I feel the same way about hand knitted throws, military blankets, and old wool blankets. We now layer old blankets and throws on our beds. Twin size ones fit nicely across the bed when topped with one the correct size. I just finished this mission last week and donated an entire pick up bed full of blankets, extra sheets, comforters, etc. It was hard to get rid of some sentimental ones, but very liberating and freeing as well. Sentimental means nothing if you don’t use them and our family didn’t. So now they can be cherished by some other families that need them. Plus, now I have room in the linen closet for my sewing machine and quilt fabrics as well as the few spares I did keep! Whoo! Our local pet shelters are always needing blankets and towels. I also cut them in half to throw over our cars to keep the dust off. My husband thanks me for that! My husband's grandmother gave us 6 hand-crocheted blankets. They don't match in any room but are in our basement. We have very little storage but don't want to get rid of them (but also so want to get rid of all but one or two) for sentimental reasons. Help!